The renewed violence against coalition forces has greatly diminished hopes for a permanent peacein Iraq. In the eyes of the American public, a young Shiite cleric, Moqtada al-Sadr, has become Iraq's new "public enemy no. 1". 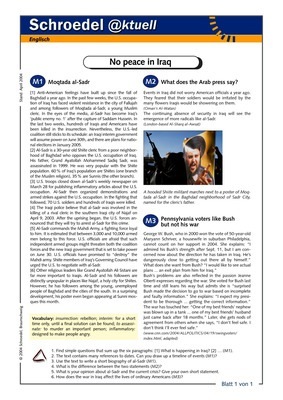 This task sheet provides information on al-Sadr and the current crisis in Iraq. It also asks how the war in Iraq affects the lives of ordinary American citizens.